The Minister of Defence, Brig.-Gen. Mansur Dan-Ali, on Monday, said the Federal Government would continue to strengthen the Nigerian Navy to defend her strategic off-shore oil installations. ‘‘For a littoral state with a huge dependence on her offshore resources, maritime security is vital to the nation’s wellbeing. ‘‘Against this background of threats, the entire nation will invariably be at a risky situation if we do not insist on a motivated and virile navy like ours,’’ he said. He said the navy was adequately positioned to provide round the clock protection for sea-based critical national assets and also ensure the security of the country’s sea-lanes. ‘‘The oceans have become the primary conducts of international trade and are central to the global economy. ‘‘The oceans and seabed are increasingly looked upon today as resource providers and critical contributors to national growth and prosperity. ‘‘For Nigeria, her geo-strategical position as a littoral state confers on her the advantage of exploring the sea and its resources for national development,’’ Ibas said. He said the threats by sea robbers pose a huge challenge that negates the vast potential of the nation’s maritime domain and the Gulf of Guinea Region in supporting the prosperity and well-being of states and their people. 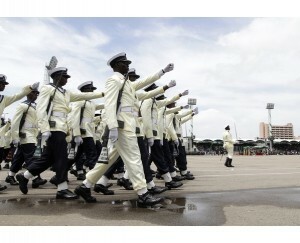 The News Agency of Nigeria (NAN) reports that the inauguration was to further fortify the presence of the Nigerian Navy around the Gulf of Guinea. NAN also reports that the ships and boats which were inaugurated at the Naval Dockyard Limited, Victoria Island, Lagos, included six Fast Patrol Craft (FPC ) and 10 Inflatable Patrol Craft (IPC).